Chronic disease is Australia’s greatest health challenge. Almost one in two Australians has at least one chronic disease, significantly reducing their quality of life. Chronic diseases have significant costs, through health system expenditure and reduced workforce participation and productivity. 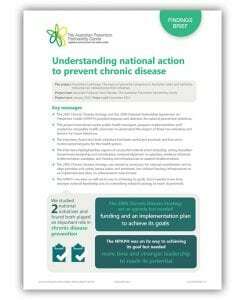 The National Chronic Disease Strategy, which the Australian Government Department of Health released in 2005. This is as an overarching, nationally agreed framework and agenda to encourage coordinated action in response to the growing impact of chronic disease on the health of Australians and the health care system. A new National Strategic Framework for Chronic Conditions is currently being developed through the Community Care and Population Health Principle Committee of the Australian Health Ministers Advisory Council. The National Partnership Agreement on Preventive Health (NPAPH), which was an agreement made in 2008 between the Commonwealth Government and all State and Territory governments in Australia. The agreement was an innovative collection of policy priorities and funding arrangements to improve the prevention of chronic disease by: (1) Laying the foundations for healthy behaviours through social marketing and the national roll out of preventive health programs; and (2) Supporting these programs and the subsequent evolution of policy with enabling infrastructure. In its first national budget delivered in May 2014, the new Commonwealth Government cancelled the NPAPH, including previous commitments for funding to 2018. Both the 2005 National Chronic Disease Strategy and NPAPH provided impetus and direction for national prevention initiatives. A better understanding of what they did and didn’t achieve could help inform future activities aimed at preventing chronic disease. The Prevention Landscape project conducted semi-structured, qualitative interviews with senior public health managers and program implementation staff from State and Territory health departments as well as senior academics, thought leaders and public health advocates from key agencies across the country. Jurisdictional responses to the cancellation of the NPAPH, with a focus on adjustments made to prevention programs in each State or Territory and the factors that influenced decision-making. The views of policy makers and thought leaders on the Australian Government’s two national policy approaches to the control of chronic disease showed that both approaches were useful, practical and set in motion potential gains for the health system. This research can inform current and future large-scale, population-level health initiatives through better understanding of how previous national chronic disease initiatives were viewed and used at national, state and local levels. As part of this project, we investigated the status of programs previously funded under the National Partnership Agreement in Preventive Health (NPAPH). In July 2015 we conducted interviews with representatives from departments of health in each jurisdiction to explore what programs had been established under the NPAPH and their status following the cessation of funding in July 2014. On the basis of this information we have put together a snapshot of NPAPH programs status as was current in July 2015. Please note that this table below is intended to provide an accessible overview of programs established under the NPAPH and does not represent an exhaustive list of preventive health programs provided by each jurisdiction. The table will be updated periodically to ensure the information is up to date. Sip® Childhood Obesity Prevention and Lifestyle (COPAL) program PEACH OPAL CoolCap Healthy Eating Advisory Service (HEAS) Refresh. This project helped to clarify the state of preventive health programs and activities in Australia and made this information publically available to both policy makers and public health researchers. Additionally, it highlighted the common successes and challenges of the NPAPH and provided a better understanding of how State and Territory governments used the National Chronic Disease Strategy. Ultimately, it is anticipated that the findings from this research will inform the next national chronic disease strategy for Australia as well as investments in population preventive health initiatives more broadly. The effect of the NPAPH cancellation on programs was more noticeable in some states and territories than others. In some states, the end of NPAPH funding meant the end of some programs. In other jurisdictions, programs continued but with different funding. Wutzke S, Morrice E, Benton M, Wilson A.What will it take to improve prevention of chronic diseases in Australia? A case study of two national approaches. Australian Health Review, 2016. This report highlights key findings of interviews with senior public health managers from State and Territory health departments as well as senior academics, thought leaders and public health advocates from key agencies across the country. The interviews explore views about the 2005 National Chronic Disease Strategy, and responses to the cancellation of the National Partnership Agreement for Preventive Health, focusing on adjustments made to prevention programs in each State or Territory and the factors that influenced decision-making. Wilson A. Budget cuts risk halting Australia’s progress in preventing chronic disease. Med J Aust 2014;200(10):558-559. doi: 10.5694/mja14.00726.